(1963) "Heat Wave" / "A Love Like Yours (Don't Come Knocking Everyday)"
(1966) "A Love Like Yours (Don't Come Knocking Everyday)"
(1966) "I'll Never Need More Than This"
"(Just Enough To Keep Me) Hangin' On"
(1974) "A Love Like Yours (Don't Come Knocking Everyday)"
"A Love Like Yours (Don't Come Knocking Everyday)" is a 1963 song issued as the B-side to Motown singing group Martha and the Vandellas' hit single, "Heat Wave", released on the Gordy label. The song, written and produced by Vandellas cohorts, Holland–Dozier–Holland, is a song where a woman praises her lover for loving her after she "broke (his) heart and made (him) blue" saying afterwards "instead of hurting back" telling her he loved her. 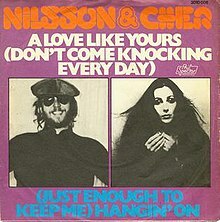 The song, while not released as a single, is regarded as a sixties classic with notable covers by Dusty Springfield, Harry Nilsson and Cher, Juice Newton, Manfred Mann, and the Animals. Ike & Tina Turner released it as a single from their album River Deep – Mountain High. Ike & Tina's version was the only version that became a charted hit peaking at #16 on the UK pop charts. This page was last edited on 18 November 2018, at 07:05 (UTC).